Sellier & Bellot offers quality brass-cased .45 ACP ammunition that will keep you on the range with your 1911, H&K Mk23 or Glock 21 . 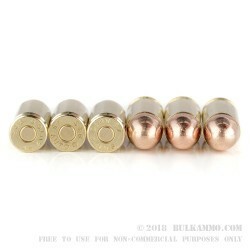 This cartridge uses a typical 230 grain full metal jacket bullet that achieves a muzzle velocity of 853 feet per second, producing typical .45 Auto ballistics and strong muzzle energy of 372 foot-pounds. 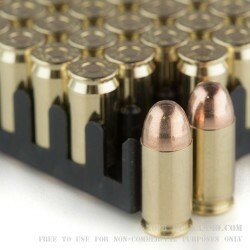 Each round in this box of 50 uses Boxer-primed reloadable brass cases. 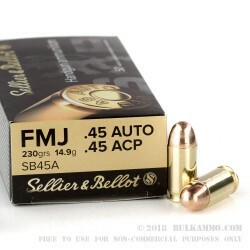 Sellier & Bellot is an ammunition manufacturer located in Vlasim, in the Czech Republic. Founded in 1825 during the era of the Austrian Empire, the company has survived many changes in the firearms industry including the obsolescence of its original product, percussion caps, and several decades of government ownership by the post-WWII Soviet-dominated Czechoslovak government. Today, the company operates as a private enterprise and has resumed its pre-war export business, sending more than two thirds of its production overseas to more than 70 countries. A favorite for target practice in the US, S&B ammo enjoys a good reputation as one of the top quality brands in its price range. Good ammo. Ruger 1911 likes it. No jams or misfires. Super fast shipment also.